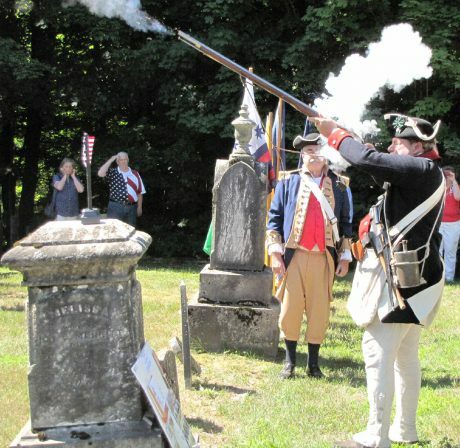 GRANBY – Nearly 200 years after his death, a Revolutionary War soldier was honored with a gravesite marker and wreaths in a small rural cemetery during Independence Day weekend July 3. The ceremony honoring veteran Elias Cady was organized by the Syracuse Chapter of the National Society of Sons of the American Revolution. The Phoenix American Legion Post 418 provided the color guard, while members of the SAR and Kayendatsyona – Fort Oswego, Ontario, and Betsy Baldwin chapters of the Daughters of the American Revolution gave remarks and placed wreaths on the grave. 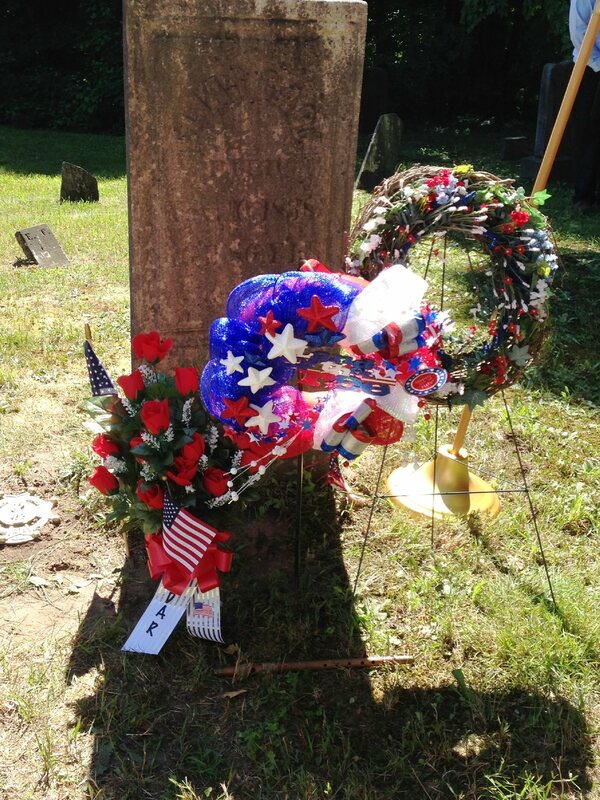 The gravesite of Revolutionary War soldier Elias Cady was decorated with wreaths and a marker designating his service during the Revolutionary War. The ceremony was part of Oswego County bicentennial activities during Independence Day weekend. Robert Gang, president of the Syracuse chapter of SAR, led the ceremony and recounted Cady’s story. Gang noted that one of Cady’s descendants, David Rogers of Prince Edward Island, Canada, purchased the grave marker in his ancestor’s honor and asked the Sons of the American Revolution to place it on Cady’s grave. Elias Cady was born in 1753 in Coventry, Conn., the sixth child of Ebenezer and Prudence Palmer Cady. The family was among the early pioneers of the town of Canaan, Columbia County, NY, and settled there about 1762. 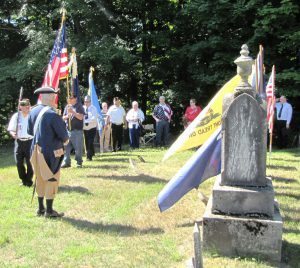 Members of Phoenix American Legion Post 418 served as honor guard at the grave marking ceremony of Revolutionary War veteran Elias Cady. Standing at attention is Bruce Coyne, treasurer of the Thousand Island Chapter of SAR. Cady and his wife, Keziah Doty Cady, settled in New Concord, NY, following the Revolutionary War and had 12 children. It is believed that Cady moved to Granby in the spring of 1837 with his son, Elias Cady Jr., and his family. Their farm was in the southwest corner of the town of Granby, near the Cayuga and Onondaga County lines. Elias died in 1838 and is buried in the family plot in Merritt Cemetery on Merritt Road. Gang said the Syracuse chapter of the Sons of the American Revolution has placed numerous grave markers to honor deceased Revolutionary War veterans in cemeteries all over Central New York.